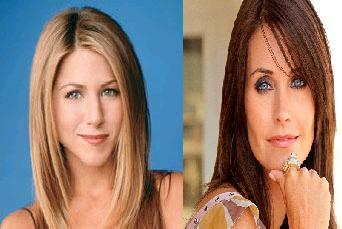 Jennifer Aniston and Courteney Cox were spotted enjoying and having fun on their surfboards while holidaying in Hawaii. The “Friends” stars took to the water with different attitudes. Jennifer Aniston, who is wearing a skimpy white bikini top, red shorts and shades, appeared to lap up riding the waves in an attempt at stand-up paddle surfing. Her best friend Courteney Cox, who is wearing a long-sleeved tracksuit top over her bikini and arms outstretched, seemed to be taking surfing a lot more seriously and appeared to be amused by her admirable efforts. She seemed trying ‘hang 10’, a stunt involves having all your toes over the edge of the board while waving two ‘high fives’. The pair often holidays together with David Arquette and Coco, who is the daughter of Courteney and David.